In June 1947, in accordance with the Truman Doctrine, the United States enacted the Marshall Plan. This was a pledge of economic assistance for all European countries willing to participate, including the Soviet Union, who refused and created their own Molotov plan for the Eastern Bloc. In early 1947, Britain, France, and the United States unsuccessfully attempted to reach an agreement with the Soviet Union for a plan envisioning an economically self-sufficient Germany. In June 1947, in accordance with the Truman Doctrine, the United States enacted the Marshall Plan, a pledge of economic assistance for all European countries willing to participate, including the Soviet Union. The years 1948 to 1952 saw the fastest period of growth in European history; industrial production increased by 35%, some of which has been attributed to the Marshall Plan aid. The Soviet Union refused the aid because Stalin believed that economic integration with the West would allow Eastern Bloc countries to escape Soviet control. In response, the Soviet Union created the Molotov Plan, later expanded into the COMECON, a system of bilateral trade agreements and an economic alliance between socialist countries in the Eastern Bloc. The system created by the Soviet Union in 1947 to provide aid to rebuild the countries in Eastern Europe that were politically and economically aligned to the Soviet Union. An American initiative to aid Western Europe in which the United States gave more than $12 billion in economic support to help rebuild Western European economies after the end of World War II. In early 1947, Britain, France, and the United States unsuccessfully attempted to reach an agreement with the Soviet Union for an economically self-sufficient Germany, including a detailed accounting of the industrial plants, goods, and infrastructure already removed by the Soviets. In June 1947, in accordance with the Truman Doctrine, the United States enacted the Marshall Plan, a pledge of economic assistance for all European countries willing to participate, including the Soviet Union. The plan’s aim was to rebuild the democratic and economic systems of Europe and counter perceived threats to Europe’s balance of power, such as communist parties seizing control through revolutions or elections. The plan also stated that European prosperity was contingent upon German economic recovery. One month later, Truman signed the National Security Act of 1947, creating a unified Department of Defense, the Central Intelligence Agency (CIA), and the National Security Council (NSC). These would become the main bureaucracies for U.S. policy in the Cold War. Stalin believed that economic integration with the West would allow Eastern Bloc countries to escape Soviet control, and that the U.S. was trying to buy a pro-U.S. realignment of Europe. Stalin therefore prevented Eastern Bloc nations from receiving Marshall Plan aid. The Soviet Union’s alternative to the Marshall plan, purported to involve Soviet subsidies and trade with central and eastern Europe, became known as the Molotov Plan (later institutionalized in January 1949 as the COMECON). Stalin was also fearful of a reconstituted Germany; his vision of a post-war Germany did not include the ability to rearm or pose any kind of threat to the Soviet Union. In early 1948, following reports of strengthening “reactionary elements”, Soviet operatives executed a coup d’état in Czechoslovakia, the only Eastern Bloc state that the Soviets had permitted to retain democratic structures. The public brutality of the coup shocked Western powers and set in a motion a brief scare that swept away the last vestiges of opposition to the Marshall Plan in the United States Congress. The twin policies of the Truman Doctrine and the Marshall Plan led to billions in economic and military aid for Western Europe, Greece, and Turkey. With U.S. assistance, the Greek military won its civil war. Under the leadership of Alcide De Gasperi the Italian Christian Democrats defeated the powerful Communist-Socialist alliance in the elections of 1948. At the same time, there was increased intelligence and espionage activity, Eastern Bloc defections, and diplomatic expulsions. The Marshall Plan (officially the European Recovery Program, ERP) was an American initiative to aid Western Europe, in which the United States gave over $12 billion (approximately $120 billion in value as of June 2016) in economic support to help rebuild Western European economies after the end of World War II. The plan was in operation for four years beginning April 8, 1948. The goals of the United States were to rebuild war-devastated regions, remove trade barriers, modernize industry, make Europe prosperous again, and prevent the spread of communism. The Marshall Plan required a lessening of interstate barriers, saw a decrease in regulations, and encouraged an increase in productivity, labor union membership, and the adoption of modern business procedures. The Marshall Plan aid was divided among the participant states on a per capita basis. A larger amount was given to the major industrial powers, as the prevailing opinion was that their resuscitation was essential for general European revival. Somewhat more aid per capita was also directed towards the Allied nations, with less for those that had been part of the Axis or remained neutral. The largest recipient of Marshall Plan money was the United Kingdom (receiving about 26% of the total), followed by France (18%) and West Germany (11%). Some 18 European countries received Plan benefits. Although offered participation, the Soviet Union refused Plan benefits and blocked benefits to Eastern Bloc countries such as East Germany and Poland. The years 1948 to 1952 saw the fastest period of growth in European history. Industrial production increased by 35%. Agricultural production substantially surpassed pre-war levels. The poverty and starvation of the immediate postwar years disappeared, and Western Europe embarked upon an unprecedented two decades of growth during which standards of living increased dramatically. There is some debate among historians over how much this should be credited to the Marshall Plan. Most reject the idea that it alone miraculously revived Europe, as evidence shows that a general recovery was already underway. Most believe that the Marshall Plan sped this recovery but did not initiate it. Many argue that the structural adjustments that it forced were of great importance. The political effects of the Marshall Plan may have been just as important as the economic ones. Marshall Plan aid allowed the nations of Western Europe to relax austerity measures and rationing, reducing discontent and bringing political stability. The communist influence on Western Europe was greatly reduced, and throughout the region communist parties faded in popularity in the years after the Marshall Plan. 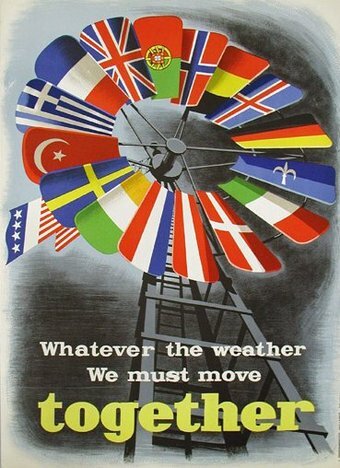 Marshall Plan: One of a number of posters created to promote the Marshall Plan in Europe. Note the pivotal position of the American flag. The Molotov Plan was the system created by the Soviet Union in 1947 to provide aid to rebuild the countries in Eastern Europe that were politically and economically aligned with the Soviet Union. It can be seen as the USSR’s version of the Marshall Plan, which for political reasons the Eastern European countries would not be able to join without leaving the Soviet sphere of influence. Soviet foreign minister Vyacheslav Molotov rejected the Marshall Plan (1947), proposing the Molotov Plan – the Soviet-sponsored economic grouping which was eventually expanded to become the COMECON. The Molotov plan was symbolic of the Soviet Union’s refusal to accept aid from the Marshall Plan or allow any of their satellite states to do so because of their belief that the Plan was an attempt to weaken Soviet interest in their satellite states through the conditions imposed and by making beneficiary countries economically dependent on the United States. The plan was a system of bilateral trade agreements that established COMECON to create an economic alliance of socialist countries. This aid allowed countries in Europe to stop relying on American aid, and therefore allowed Molotov Plan states to reorganize their trade to the USSR instead. The plan was in some ways contradictory, however, because at the same time the Soviets were giving aid to Eastern bloc countries, they were demanding that countries who were members of the Axis powers pay reparations to the USSR. “Marshall Plan.” https://en.wikipedia.org/wiki/Marshall_Plan. Wikipedia CC BY-SA 3.0. “Cold War.” https://en.wikipedia.org/wiki/Cold_War#Containment_and_the_Truman_Doctrine. Wikipedia CC BY-SA 3.0. “Molotov Plan.” https://en.wikipedia.org/wiki/Molotov_Plan. Wikipedia CC BY-SA 3.0. “Marshall_Plan_poster.JPG.” https://en.wikipedia.org/wiki/Marshall_Plan#/media/File:Marshall_Plan_poster.JPG. Wikipedia CC BY-SA 3.0.